consistently did my hair the way I liked. The barber who did the best job was unable to cut my hair in a consistent basis. I was left with trying out new barbers; more often then not, I ended up visiting them once due to them not cutting my hair the way I wanted. I even had an incident where the woman who cut my hair left me with whelts on my neck. I wore the style for about 8 months before I was really done; I allowed my hair to grow in. I disguised my imbalanced style by wearing my hair in blown out styles such as bantu knots and flat twists with the ends bantu knotted and eventually flat ironed my hair for a job interview. look at pinterest for inspiration! Knowing that my hair length on the sides and in the back was extremely shorter than the rest of my hair, the only viable option was a tapered cut. I was discussing my hair delima with a woman I work with and she recommended her stylist. After not having a stylist for years I was hesitant but that didn’t outweigh my desire to cut my hair. I made the appointment and hoped for the best! I met Mrs. Yvonne early in the morning. She was a pleasant woman who listened to what I wanted, as well as my fears about having such a drastic cut. One thing that made me comfortable with her was the fact that she had locks; I figured that since her hair was natural she’d at least be careful of how she handled my hair. After showing her images of the cut and describing the color I wanted, she go to it. As I sat in the chair and watched inches being chopped off, I felt a sense of relief and excitement! My New Do! 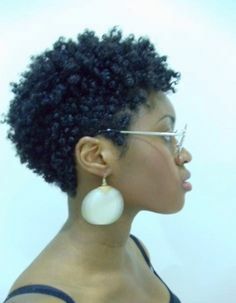 Tapered Fro! Two hours later I was a new woman and loved my new look! I hadn’t told anyone I was getting the cut, so when I showed up mouths dropped! Such a drastic cut for someone who’s always had hair, but I couldn’t be happier!